Worthing is a large seaside town in West Sussex. Its name means "(place of) Worth/Weorð/Worō's people" and over the years has been recorded as Weoroingas, Ordinges (1086), Wuroininege (1183), Wurdingg (1218), Wording or Wurthing (1240), Worthinges (1288) and Wyrthyng (1397). Worthen was used as late as 1720. It was a small fishing hamlet for many centuries until it developed into a fashionable Georgian seaside resort during the 18th century and was popular with the well-known and wealthy people of the time. The growth continued and Worthing is now also a borough with 9 districts. Its coat of arms contains three silver mackerel, a horn of plenty overflowing with corn and fruit on a cloth of gold, and the figure of a woman (most likely Hygieia, the Greek God of Health) holding a snake. The town's motto is 'Ex terra copiam e mari salutem' (Latin), which translates into 'From the land plenty and from the sea health'. 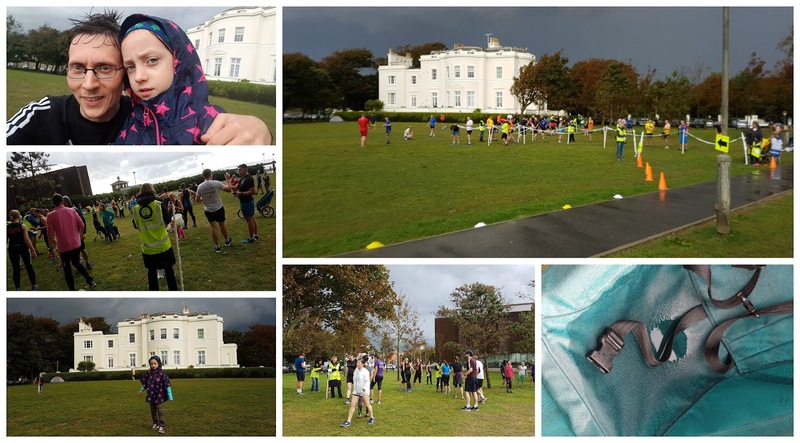 We travelled to 'Sunny Worthing' (as the town is known) to take part in Worthing parkrun, which had its inaugural run on 11 June 2016 and since then has consistently attracted over 200 runners - the official average number of runners per week at the time of our visit was 245.3. The course is an all-tarmac (finish line on grass) out-and-back and is totally flat. Please note that the promenade is a shared-use space with cyclists, so try to stay aware of any bikes approaching and don't make any sudden sideways maneuvers without having a quick look over your shoulder. There is a note on the venue's page that there is the risk of cancellation if the stones from the beach are washed onto the path during inclement weather, so keep this in mind. It's also worth mentioning that the Worthing Festival takes place during the last two weeks of July and this could lead to cancellations, so be sure to check before making plans to visit. We drove into the town using the A259 Brighton Road and had to find somewhere to park. There were a few options - the closest are the Beach House East and Beach House West car parks which can be accessed from the main road just next to the Splashpoint Leisure Centre. In the end we found a spot on the seafront right next to the parkrun start area and fed the machine with enough change to cover us for three hours which cost 20p per 12 minutes (£1 per hour). I have a parking tip for you! If you arrive early enough and fancy a warm-up jog before the run - drive along the seafront for about 1 mile (to the west) and park for free in one of the roadside spaces next to the seafront - we considered this option, but as my daughter had decided that this would be a buggy running day coupled with the nasty rain clouds that were rapidly approaching, I decided that we needed to park closer to the finish so we could easily grab a change of clothes and towel post-run (my best decision of the day, I think). No 'Sunny Worthing' for us today! If you travel to Worthing by train, you have the choice of alighting at Worthing Station or East Worthing Station. The main Worthing Station is a little closer but there's not much in it. There is also a West Worthing Station but this is further away from the start/finish areas. If you travel by train watch out that you don't run into a knucker (a kind of water dragon) during your walk to the beach - folklore says that a Knuckerhole (a very deep or bottomless pond) exists (or existed) not far from East Worthing railway station. Cyclists in the town are catered for by the dedicated cycle lanes which run along the seafront, so travelling by bicycle is a real option for many. There are a few different options for securing a bike - there are loads of racks outside the main entrance to the Splashpoint Leisure Centre, there are also more cycle racks on the promenade at the Splash Point (see below for more info) and finally there are some outside the post-run coffee venue 'Coast Cafe des Artistes'. 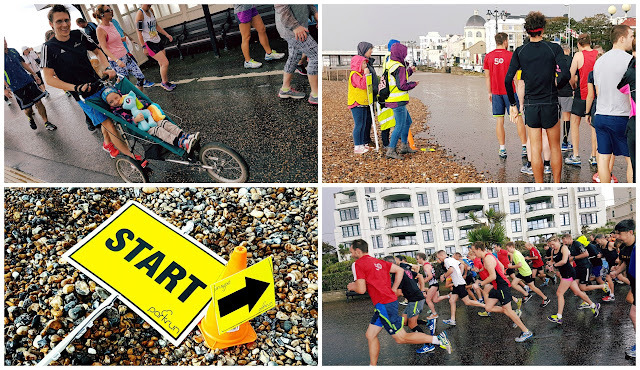 Toilets can be found along the promenade and the official course page suggests the Pavilion (next to the pier) or the Lido (a bit further along) as the closest toilets to the start of the run. I couldn't find the ones at the Pavillion but did find some at the Lido which worked out fine, but note that they are about 700 metres from the pre-run meeting point so leave enough time to get there and back. 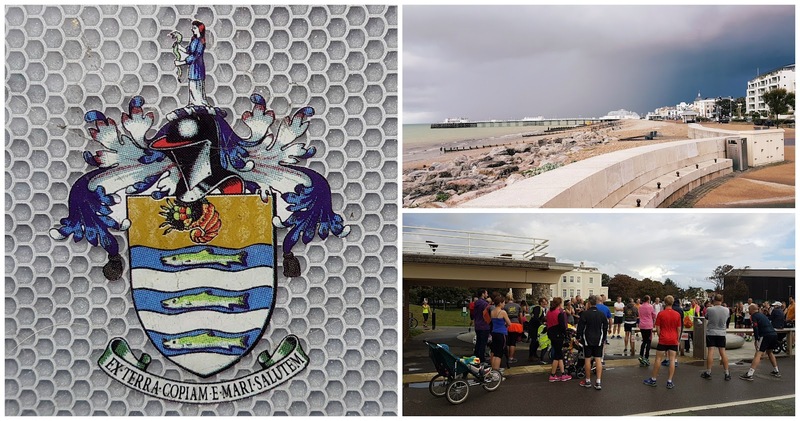 I read something on the promenade that suggested that the leisure centre may have some, but didn't pop in to verify this - also as these are not suggested on the main Worthing parkrun page, it may worth avoiding them. The pre-run meeting point is on the promenade in front of the listed Beach House Mansion (the large bright white building) and the run starts just to the west of the Splash Point - This fairly recent addition to Worthing's promenade features a grove of Tamarisk trees, engraved slate boulders and a water feature. From this point, the runners head to the west along Marine Parade for the 'out' part of their five kilometre Saturday morning run. On the day we visited, the dark clouds had now reached Worthing and the day's 182 runners headed off into a delightfully miserable, rainy headwind. 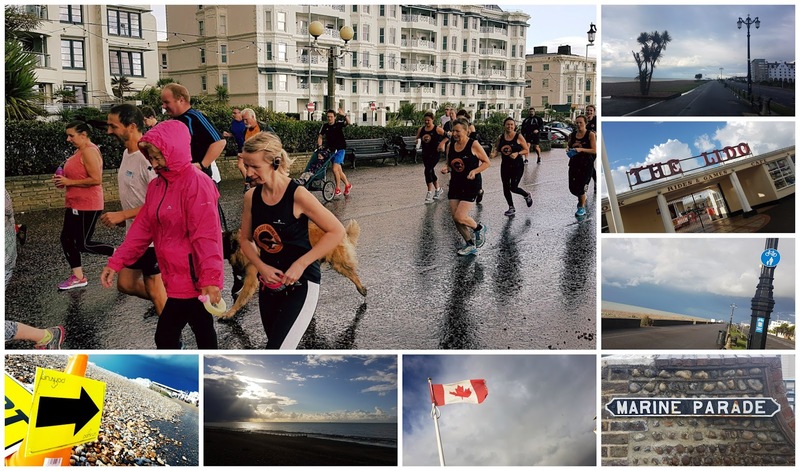 After 300 metres the runners pass the grade II listed Worthing Pier which was originally built in 1862 and remodelled in 1935 after being partly destroyed by a fire in 1933. It was used on the album cover of Indie band Gene's compilation album 'To See The Lights'. In 2006 it won The National Piers Society's 'Pier of the Year' award. It has also been used since 2008 for the Worthing Birdman competition, however the 2016 event was cancelled and it looks like it may not return. Further on, the runners pass the Lido - this started out as a bandstand and as the popularity of band music declined, it was turned into an unheated, open air swimming pool. The swimming pool was eventually built over in 1989/90 but retained its name when it became a Family Entertainment Centre. By this point of the run I couldn't actually see anything as my glasses were covered in rainwater so I spent the rest of the run peering over the top of them. We continued along the promenade, past the Canadian Memorial Stone and flag which honours the Canadian men and women that were stationed in West Sussex and Worthing during WW1 and WW2. There are all sorts of exotic looking palm trees towards the western end of promenade and before I knew it, we had reached the turnaround point which was marshalled and marked with a cone. Heading back with the wind giving us a nice little push was much more pleasant than the outgoing section had been, but we were already soaked from head to toe and were both looking forward to drying off. During our return journey I managed to spot the Dome Cinema (another listed building) which is one of the oldest working cinemas in the UK. It was constructed by Carl Adolf Seebold (Swiss) in 1910 and opened in 1911. It was originally called 'Kursaal' (in German it's a public building in a health resort, where entertainment is provided) but with the start of WW1, the locals became increasingly anti-German, so a competition was held in 1915 to find a new name. I've mentioned that this course is an out-and-back, but the finish is not in the same place as the start. 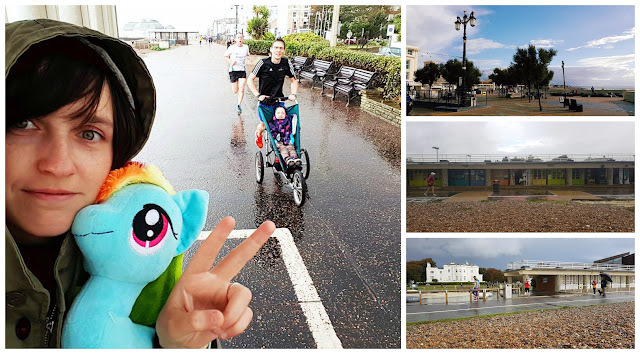 So when returning we ran straight past the start line, across the Splash Point, past the post-run cafe and the artist's huts, and were then directed into the grounds of the Beach House where we followed a curved path around to the finish line on the grass. We were given our finishing token and headed straight over to get it scanned. By this point, the rain had eased off a little, however the dry period didn't last for long so we hurried back over to the car to dry-off and change clothes. We returned about half-and-hour later to have some coffee and breakfast in 'Coast Cafe des Artistes' which was delightful. Behind the cafe, there is a children's playground and the Worthing Sand Courts which can be booked for beach volleyball, beach soccer (football?) or beach tennis (and more). The results for event 16 were processed a few hours later and despite a very slow start from the back of the field we were pleased with our efforts for the morning. If you'd like to see the course in more detail please head over to Strava and have a look at my GPS data from the run, here: Strava: Worthing parkrun 16. It's a very fast course and could be one for a pb attempt providing you can avoid the wind which seafront venues tend to suffer from. 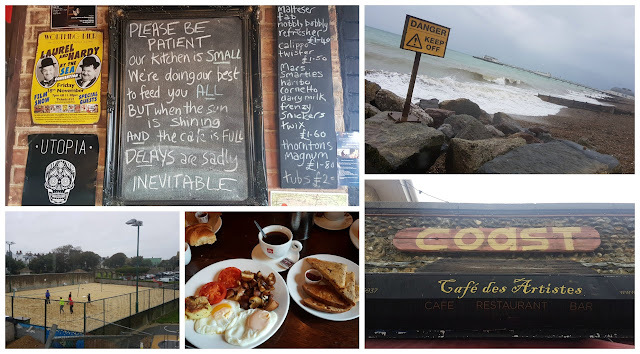 We left feeling happy that we had visited Worthing and the wife says that we should go back, but just maybe when the weather is a little better.